Hello there, I have a new dvd called "Mastering the Dramatic Still Life" by C.W. Mundy. I asked my daughter for it for Christmas and she ordered it for me. I have only viewed it once but plan to watch it again and again. He talks about the 7 foundational truths to a successful still life. I tried to think about the things he said while painting this. I do think still lifes can be boring if everything is right in the middle of the canvas and it looks very staged. I have painted a lot of those myself, lol. Sometimes I feel I painted them well but I think composition is the most important thing. If the composition is bad it doesn't matter how well you paint it, it isn't going to be a good painting. I am pretty happy with this but next time I want to get more paint on the canvas. This is oil on a 8 X 10 stretched canvas. I am still trying to find myself as an artist but I am getting a better idea of where I want to be eventually. I love it though and I won't give up. Have a great day! Hello there, I hope you all are enjoying the holidays. It sure looks like Christmas around here, we have had several snowfalls already this year. I think it will be a long winter. This painting was done looking at one of my plein air paintings. This is oil on a 16 x 20 stretched canvas. I really liked my smaller version and wanted to paint it larger. I will be doing a art show Feb. 5th and thought it would be nice to have a few larger paintings to take along. Of course it will be varnished and framed. Hi there! Another painting of fruit in a box. This time I set two green apples in the box with a light and painted it in oils on a 8 x 10 stretched canvas. I am trying to slow down with these and think "value". I have quite a bit of paint on here, which I like. I feel if you are going to paint with oils why not show them off. A while back I was reading an article and it gave several points to follow as far as when your painting was completed, things they check for in a finished painting. One was does the painting read correctly from a distance and is your eye rewarded when you get up close. I love to get up close to a painting and see brushwork and juicy strokes. I think it's great we are not all trying to paint the same, there is no wrong or right way is there? My posting may slow down for a bit with the holidays and I am working on a couple of pieces for a show in February called "Dance with me". I am busy painting though and lovin it! Hi there, Tonight was the opening at Gallery 42 of all of the paintings we did this summer in Mason, Ohio. There were about 50 paintings in all, a very nice show. I have 11 paintings in the show and the show will hang into January. We didn't have a large crowd probably for a lot of reasons, the weather, close to Christmas and who knows what else. I'm hoping a lot of folks get in to see the show while it's up, most of all I want people to see it and enjoy it. I think one of my paintings did sell tonight, it's on hold. 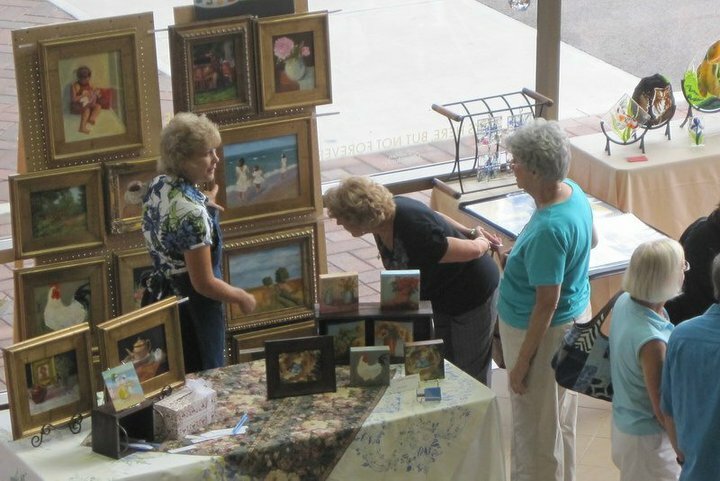 Here are some of the people that have work in the show standing by one of their paintings, these are the people that participated that are in my Monday morning painting group. Check out my paintings on Ebay, they end Tuesday night and could still make it to you by Christmas. Hi Everyone, Our last camping trip for the season we went to visit Shawnee State Park, it is near Portsmouth, Ohio. In Portsmouth they have a huge flood wall that is painted with all of these different murals depicting the history of the town. Very interesting, worth a visit. I always love getting up close to artwork to see the brushstrokes and with huge murals like this it is so interesting to see how they read from a distance and then to get right up on them and view the artists work. Anyway while we were in the campground I started this painting and finished it later with my reference photos, it is oil on a 8 x 10 Raymar panel. Let me say that I feel like a lucky woman when I am outside painting and the weather is great, I am so blessed to have painting in my life. I am blessed for so many reasons, of course my wonderful family and I am blessed to have so many friends that visit my blog and collect my art. I love blogging and I appreciate your visits and love reading your comments. If you would like my new posts emailed to you just enter your email address in the Google Groups box. Hi, This is a commission, painted from a pretty bad reference photo. I know some people refuse to use bad reference photos but sometimes you don't have a choice. This was painted for the grandmother of this little girl and she had to sneak the reference photo away from her daughter. I cropped it to focus on the area around her face which made it even harder to see detail. Anyway she is very pleased with it and I am hoping her daughter loves it too. This is oil on a 8 X 10 Raymar panel and she is purchasing it in this frame. I am working on a couple of pieces for a show in February so I can't show you those until the end of January. The theme is dance and I love the idea. Also I just heard today I was accepted into a show in February, it's in a church and it's their 6th year. I did it last year but we had a huge snow storm so I'm keeping my fingers crossed for good weather this year. Please check out my paintings on Ebay It's getting late for commissions but the pieces on Ebay could be there for Christmas. Hello, I painted this last week, another painting where I am trying to really look at values. Values are the hardest part of painting for me, I have a "Picture Perfect Viewfinder" that I use but not as often as I should. It is a tool I ordered that has different size squares you can look through with composition lines to set up your paintings but the best thing it offers are red transparent windows you can look through to judge value. It can really tell you where you are off, sometimes I think things look pretty good and when I look through it I see that I have too many colors of the same value. I have been trying to get better photos of my work too but I'm struggling. I have tried so many things, different lights, outside, near windows and lately I am shooting mostly at night with one daylight lamp. I use a tri-pod and timer so I'm not touching the camera , now I'm moving the light around trying to reduce glare. This is oil on a 8 X 10 stretched canvas. You have to do so many things well to be an artist other than the most fun part which of course is playing in the paint. Off to do some of that now. Have a great day! Hi there, I decided to just set different types of fruit in a box and paint them, mostly to practice painting values. Last week I did these pears on a 5 x 7 panel and on Monday I did apples, I'll post that soon. I did use a palette knife to create some texture. One of the local galleries just posted a new idea for a show in February, it will be about dance. I have several ideas already, I love when they do these shows. It really encourages me to paint when I have a goal. Hi there, All summer at least one day each week several of us have been out painting in our town of Mason, Ohio. One of the galleries in town is going to have a show representing our pieces. I think I painted about 16 total but I am entering 11, here are a few photos showing all 11 framed. Excuse the glare but it will give you an idea of how they look together, I'll take more photos when the show opens. A few have the corner protectors on them, overlook those, lol. We have an opening on December 11th from 4-8 at Gallery 42, please stop by if you are in the area. We are trying hard to get the word out, I feel proud of our efforts and I think if the local people can be made aware of it they will come. A lot of folks stopped by to talk to us while we were out painting and seemed very interested. 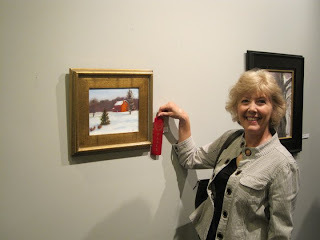 Good news, the painting that just took 2nd place in the Holiday card contest sold today at the gallery. Hi again, I guess you figured out by now I love the work of Edward Potthast, mostly his sweet children on the beach. I painted my version of another one of his, everything is freehanded so it's not an exact copy. This is oil on a 8 x 10 stretched canvas. Hello there, I enjoy painting my own Christmas card, this is the third year I have done it. I took this photo last year on Christmas eve at my brother in law's home. This gentleman was from his church I believe, I do know he made a great looking Santa. This is oil on a 8 x 10 Raymar panel. 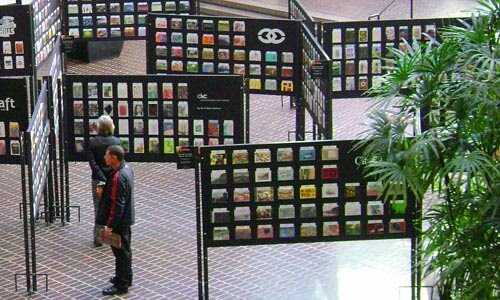 I'll have photos printed and put them into cards that are made to hold photos. Saturday night is the opening for the Holiday card competition, I'll take some photos and let you know how it goes. I would love it if he would choose one of my paintings for his card, I painted two. Hi there, While traveling in Indiana last year I noticed this great barn at the edge of the road, I had my hubby turn around and go back so I could get some photos of it. I love interesting barns and houses and I really liked the dormers on this among other things. I painted this a couple of weeks ago from one of those reference photos. This is oil on a 8 x 10 stretched canvas. Hi, Last year was the first time I participated in a Cincinnati event called Secret Artworks. 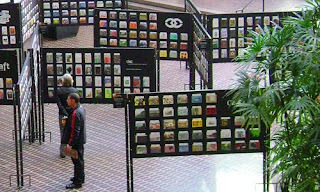 Every year they have a fundraiser where artists donate 5 X 7 paintings. People pay $125 , for their donation they get to come to a cocktail party and choose one of the small works of art. The money raised goes to support local artists and students and they do wonderful art projects around Cincinnati like painting murals. You don't sign the front, only after they choose do they get to know who the artist is. I donated 2 paintings this year. As a donating artist I get to go to the event for free, it is so fun to see people running into the room trying to find their favorite painting that they may have viewed on the online preview. It was so great when I found mine last year and someone had already chosen it. Once the original painting is gone a paper underneath it shows a photo of the painting and the artist who painted it. So here are my two painting for this years event, shhhhhhh The photo shown here is from 2008, just wanted to give you an idea of how they displayed the art. There are normally a thousand or so pieces of art entered. Just a follow up. I attended the event and they had a packed house. By the time I located my 2 paintings they were gone. Once they remove the painting there is a photo of your work with your name exposed. So great to have your work chosen early in the evening, knowing that someone wants to live with your art is such a compliment. Hello there, I just love yellow and white houses in the sunlight, I get more excited about painting those than anything else I think. This was painted last week in town, this house sits right in the middle of town and the afternoon sun was hitting it. The main street in town has sooo much traffic, it's very noisy and challenging when you are trying to paint across the street looking in between cars and trucks going by blocking your subject. While painting, a school bus was stopped at the traffic light by me and some of the children wanted to see what I was painting, I held up my painting and several of them applauded it. So cute, don't think anyone every applauded my art before. Isn't that great? it made my day. This is oil on a 8 x 10 stretched canvas. Hi there, I took this photo a while back in Ohio someplace but can't remember where, lol. It really doesn't matter, there are so many that are similar to this one. I loved the two silos behind the barn and the yellow flowers in the foreground, actually I think it's ragweed but it's lovely. I do remember when I took this photo thinking this will be a good one to paint. So hopefully I have done it justice and you like it. It is oil on a 8 x 10 stretched canvas. Hi there, I painted this in town last week while out painting with my group. This is one of the charming old buildings right on Main St., this building has a business in it called "The Sweet Shop". I bet you can guess what they sell, candy and popcorn and all kinds of wonderful yummy things. Three of us painted very near each other all looking in different directions, it is so nice to paint with someone rather than alone. We are meeting again tomorrow afternoon, should be a bit warmer then. This is oil on a 8 x 10 Raymar panel. I will miss painting outside, I have enjoyed it so much this year. Hi there, I painted this in my studio from a photo I had taken while out painting in town. 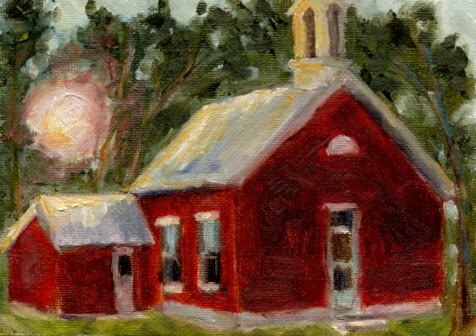 I painted the sun lit house on site and when I looked through my photos I liked this one where I had backed up and had the porch of the house next door in it so I painted it again here at home. This is oil on a 11 X 14 stretched canvas. Several people from my Monday morning group met out to paint in town again this morning, it was a bit chilly and very windy at times. Me easel blew over when the wind caught my umbrella, plein air painting comes with it's challenges. We probably only have maybe 2 more weeks or so where we will want to get out. The show with our plein air paintings opens on December the 11th, can't wait to see all of our hard work hanging. I painted two paintings for that holiday card contest I did last year, that show opens in November, crossing my fingers and hoping to get chosen for a prize. Hi there, I painted this last week while out in town. I wasn't in the mood to paint buildings so I found these roses blooming behind a photography studio on Main St. 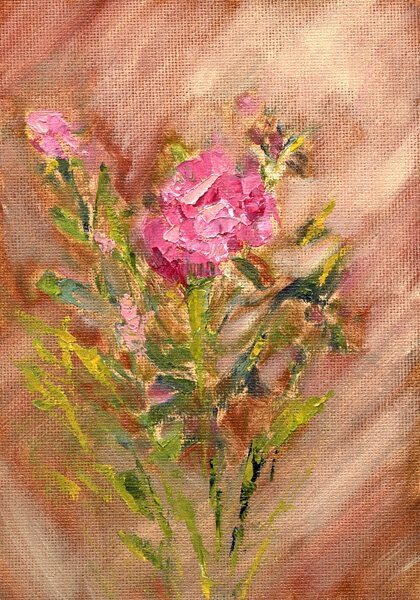 I think I may have painted roses once, though I have painted lots of other types of flowers. 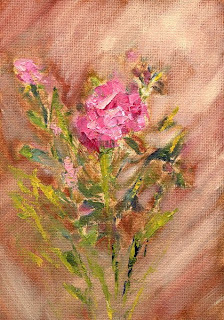 I enjoyed myself adding some texture with my palette knife on the soft pink rose that I felt was my focal point. This is oil on a 8 x 10 stretched canvas. We painted outside yesterday, it was a gorgeous day. Hopefully we'll be able to get outside to paint for several more weeks. So many paintings in my studio, gets scary in there sometimes, lol. Hi there, This is another one of the paintings done out in town this year. I just keep adding to my collection and I'll have to decide which ones I want to put in the show in December. I think they will take anything we bring, hopefully. This is one of the old houses in town and there is an insurance agency in there now. The color of the awning drew me to it. This is oil on a 8 X 10 stretched canvas. Hello there, I painted this same image a while back a bit smaller, this is 11X 14 on a stretched canvas. The smaller one hung in the Cincinnati art museum for a month or so. I loved the image so much I thought I would try it again. I used a palette knife for some of the foreground work to create some nice texture. Starting to feel like fall here, nice having it cool off a bit but we sure need rain. 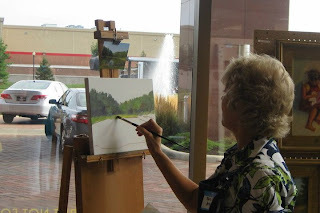 Our group is meeting outside Friday morning to paint, our days are numbered before the cold weather arrives. Hello there, This is another piece painted in town on location recently, oil on a 8 x 10 Raymar panel. One of the galleries in town will be having a show for our plein air pieces in December so that's exciting. I did paint outside Tuesday night, we met around 8 set up and watched the street lights come on. We had a full moon , I planned that don't you know? lol It was perfect, no wind and warm weather. The longer we were out there the more we could see, with the street lights you could see all of the detail of the buildings along the street. My painting came out pretty good, you don't really know what you have until you get back inside. I had a headlamp and I couldn't really aim it at my painting because of the glare so I painted pretty much from the light of the streetlight. I set my palette up the same all the time so I knew what colors I was working with and I was looking mostly at values. Anyway it was fun and I would try it again. Hi, This painting was done a few weeks ago on site. We camped for the night at Cowan Lake and I found a great spot in the shade to paint the next morning while my hubby fished. This is oil on a 8 x 10 stretched canvas. Trying something new tonight, a group of us are meeting in town to paint after dark. Very excited to try this. I am taking several different lights hoping something works well. One of the lights is the kind that straps on your head with the light on your forehead. I have to try not to look at the other artists around me as I would probably blind them, lol. Thank you for stopping by and please comment, I love reading them. Also if you would like my new posts emailed to you just enter your email address in the google group box. Hello there, About a month ago I participated in a plein air event put on by Ohio Plein Air Society. We showed up in a quaint town called Milford, Ohio, painted for about 6 hrs. and then had a wet paint sale. You may recall that I posted about it a while back. Anyway my painting did not sell and I left it in a gallery in Milford for a few weeks. I picked it up last week and touched it up a bit more and here it is. It is 9 x 12 on a Raymar panel. I'll let it dry and probably list it on Ebay at some point. Nice to have deadlines though, keeps things exciting. Have a great weekend! Hi there, This oil painting was painted looking a a painting done by Edward Potthast. I love his work, so many wonderful beach scenes with children. This isn't an exact copy as I free handed the sketch while looking at his painting. Occasionally I sketch things out with a pencil but mostly I just thin down burnt umber and sketch with a brush. I have said several times how great it would be to go on the beach today and be able to shoot reference images like this. This is painted on a 11 X 14 Raymar panel. I am dropping off a painting today for a juried show and next weekend is our local arts festival, busy and great times. I have two new paintings on Ebay, check them out. Hello there, If you were following my blog last year you might recall that I did a painting for a holiday card competition. A representative for our county will be choosing a painting to be his card and the painting will then hang in his office. We can submit up to four paintings and they will hang in a local gallery near here for a few weeks also. Last year they suggested we paint snow scenes, this year it can be anything as long as the location is here in Warren county. I tried to choose images that would look good in the format of a small card, this is a local park and I took this photo last winter while the snow was on. I have started a second painting and may do more. This is oil on a 8 x 10 stretched canvas. School is starting back so maybe next week I will go back on Ebay, summer is so slow on there. Hi there, I painted this piece last week in town. A beautiful day, I stood in the shade with hummingbirds buzzing around me. It can be so challenging to paint plein air but this day was such a pleasure. I toned the canvas with burnt sienna and some of it shows through on the foreground. I laid the paint on pretty heavy in the sunlit areas. My goal is to paint impressionistically and I want the painting to be interesting up close, heavy paint in some areas. I think this one met my expectations. This is oil on a 8 x 10 stretched canvas. Enjoy your weekend! Hi there, Here are two photos of me at the Lexus event tonight. The place is amazing for an automobile showroom. There are crystal chandeliers and a piano in the showroom and there are two lounges and a workout room for customers. The food was excellent, they served cocktails and we were entertained by a wonderful guitarist. Most people were there to enjoy the event and not buying but it was free to the artists and a great place to network. So though I didn't sell anything I think I did make some good contacts and I had a great time. It's amazing how many artists I seem to meet anytime I am painting in public. I think we need more people buying art and less producing it, maybe? lol Kidding, we have to keep painting no matter what, right?